October has long been my favorite month for all the Halloween celebrations and fall festivities. It is often so full of activites and projects that the final days seem like a marathon where I find myself trudging through the events exhausted and depleted and only half enjoying them. I seems impossible to let one element of celebration go to the wayside though when this is the only chance all year to indulge in all things spooky and dark. Then when October ends it as if you snap your fingers and the year is over too, everything moving too quickly. This year was different though, we started off the month with a grand adventure, heading up to Oregon and Washington. I’ve been wanting to return since we went to Portland back before we were married. I fell in love with that little city and it became a sort of dream future home. Someplace smaller and slower. This visit, we spent a little time there, but drove up through Washington to visit a few of the National Parks and just explore the whole area. Posts from our trip coming soon, as I just started to sift through the photos. When we returned, October marched forward, we visited haunted houses, we had our Halloween marathon, we watched scary movies and spent time with friends. There were obligations and stresses just like regular life but it wasn’t overwhelming like it sometimes is. Sometimes I want to do everything and I cannot possibly do everything. This year has felt slow and strange. I had a sort of self imposed moratorium on creative projects over the past few months as we went on more outdoor adventures and I just didn’t have the time. What I realized though, as I took the time to create my Halloween costume this year, is that I missed the simple joy of making something with my hands. It may not measure up to the experience of exploring a new place but one can’t be away from home all the time (well, that’s arguable, but it’s certainly not for me). There’s also the gratification of being able to finish something, even if it is small, which is a counterpoint to the ambiguous and drawn out completion of film projects. It’s something I had been telling myself wasn’t so important, but is really something that I need. Last year at this time I shot my short film, Forgiveness. Since completing that project, my feelings of accomplishment have tapered off. Having any sort creative success means constantly pushing forward even when no one is looking and it’s tiring and often unrewarding. I wrote another feature earlier this year but since then I’ve been struggling to start the next script, one that I have almost entirely mapped out already. I managed to break through whatever bizarro writer’s block I was experiencing and get a handful of pages down finally. I know it will still be work to get through the rest, but having finally started is freeing in itself. You may have noticed my intermittent dissatisfaction with Los Angeles. A big part of it is the heat. The temperatures here can be oppressive in an undefinable way. I realize it’s not so hot as some other desert places but the way it drags on for so much of the year wears on me. This drought too has been occupying a space in my mind, a constant worry in the background, one I can hardly do anything about. It seems selfish to complain about warm weather and sunny skies but there is a certain monotony to it and a certain smoggy haze too. This Halloween we went to a party at some friends’ house and as we roasted vegan marshmallows over a fire pit it started to rain. 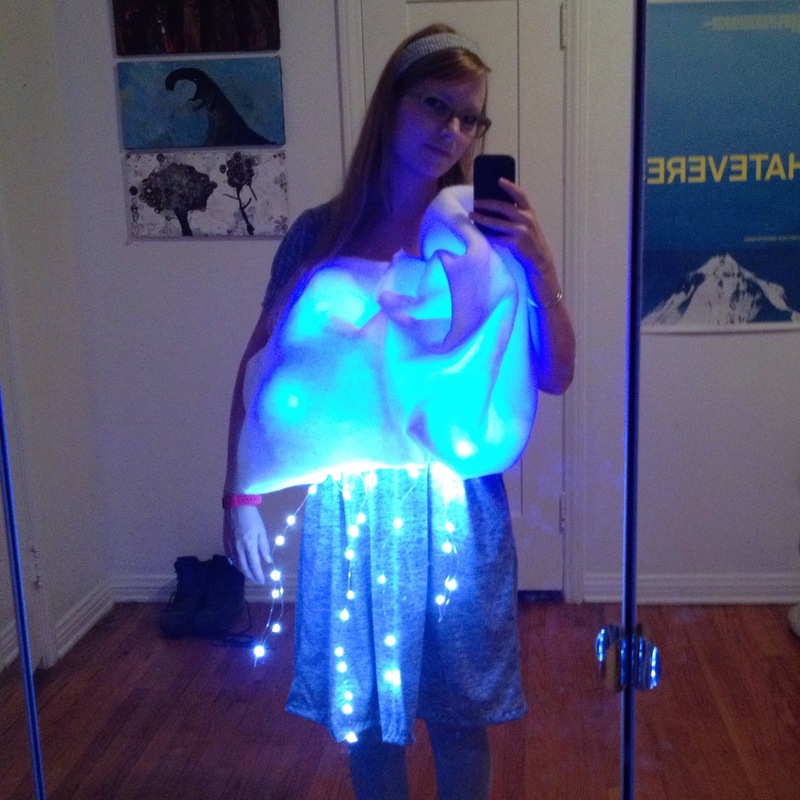 Did I mention my costume was a rain cloud? We drove through the edge of West Hollywood to see those who were making their way to or from the parade there in their wild costumes. We ended the evening with a late night meal with friends at Doomie’s. As we drove, the gentle rain turned into a downpour. It was beautiful and such a relief. The weather has been cool now and it finally feels like fall (though it’s going to be nearly 90 degrees again this week). 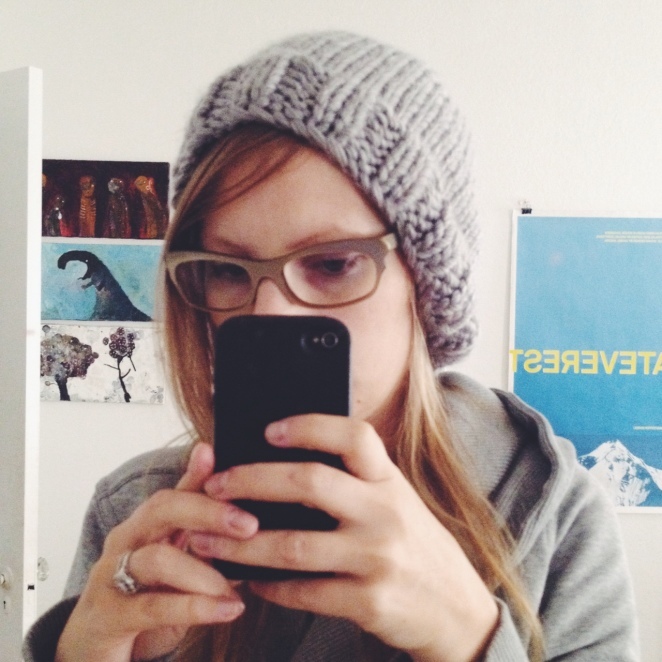 I knit myself a new hat (pictured above) snuggled up in bed watching X-Files. Shawn and I walked around town while we were waiting on some car repairs and passed through a movie shoot where hundreds of bikes were set up in the middle of Wilshire Boulevard. We visited LACMA and Whimsic Alley and I started to come to peace with this city. I know it’s only because I’ve never lived anywhere else that it’s hard for me to see how special Los Angeles can be. I know crazy magical things happen here all the time, they’re just not usually the same kind of magic I’m looking for. This whole post makes me want to meet you somewhere cool and autumnal with some hot tea and a bit of a campfire and talk about all of this — creating and time and exploring and all of everything. I’m always excited to read your words here, Alix. That hat is amazing. And I love this post.